(Bloomberg) -- The political crisis in Venezuela risks disrupting global crude markets as the type of oil pumped by the OPEC member becomes increasingly scarce, according to the International Energy Agency. The U.S., Venezuela’s biggest customer, is banning oil imports from the country as it condemns President Nicolas Maduro for fraudulently clinging to power after disputed elections. 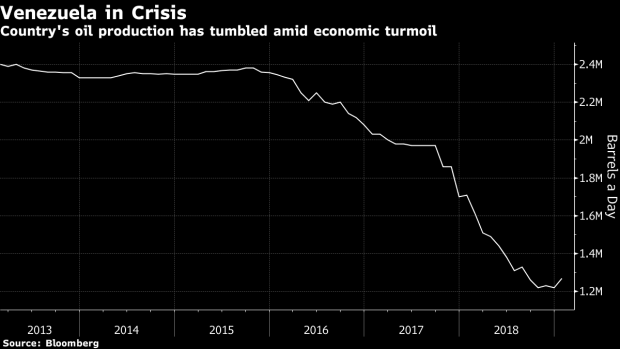 Venezuela’s output is already at the lowest in decades as a spiraling economic crisis takes its toll on oil infrastructure. While global markets remain comfortably supplied, disruption in Venezuela poses a threat because production of the heavier, higher-sulfur crude it pumps is being reduced elsewhere, the IEA said in a monthly report. The Organization of Petroleum Exporting Countries is cutting output to prevent a worldwide surplus, while member nation Iran is being hit by American sanctions. Oil prices have remained steady near $60 a barrel in London even as turmoil builds in Venezuela, as markets work through plentiful supplies accumulated last year, the IEA said. But a shortfall of heavy-sour crude can cause complications for many refiners, such as those along the U.S. Gulf Coast, configured to process it. Heavy-sour supplies are common in OPEC, whose members started a new round of production cutbacks last month. The group made a strong start to the strategy, slashing output by 930,000 barrels a day to the lowest in almost four years, the IEA said. The cartel is broadly on track to keep markets balanced this year, even though demand for its crude will be lower than previously thought, the IEA’s report indicated. OPEC pumped about 30.8 million barrels a day in January, just above the 30.7 million required on average in 2019. Estimates for how much crude is needed from OPEC were lowered by 300,000 barrels a day from last month’s assessment amid surging supplies from its rivals, driven by the U.S. shale boom. American supply growth this year will exceed Venezuela’s total output, the IEA said, another signal that OPEC’s efforts to buoy prices may ultimately prove self-defeating.